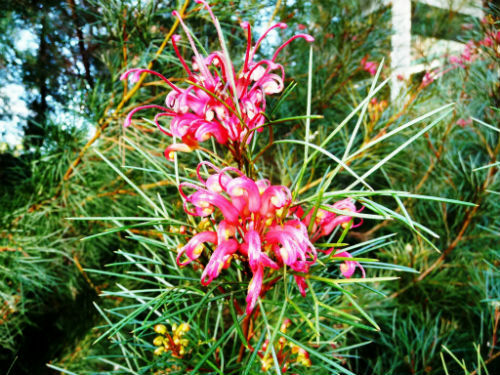 Australian Plants Society NSW - Grevillea "Bonfire"
Grevillea “Bonfire” is said to be an upright shrub reaching a height of two metres. We know of a group of “Bonfires”, in a garden, that are about five metres tall. The leaves are dark green and narrowly divided. New growth has a bronze colour. The large clusters of coral red flowers are carried above the foliage, appear for many months and are constantly visited by honeyeaters. “Bonfire” is grown in the USA where it is said to attract hummingbirds. The hybrid arose as a chance seedling in the gardens of the Austraflora Nursery, Victoria. The parents of this spectacular hybrid are G. johnsonii and G. wilsonii. The former parent is from NSW whilst the latter is a native of Western Australia. This makes “Bonfire” a transcontinental hybrid. G. “Bonfire” is a spectacular plant. Foliage and flowers are attractive features. Could be grown as a “stand alone” specimen plant or incorporated in an informal hedge. G. “Bon Accord” is an alternative name.